To hold expertise in this domain, we are providing a broad range of yarn dyed woven fabrics. In order to fabricate these fabrics, we use the finest quality raw material and modern tools and equipment. 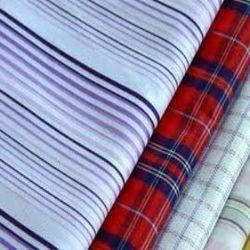 our offered fabrics are widely demanded in the garment industry for various applications. We provide these fabrics in several colors, designs and patterns to our clients for them to choose from as per their requirements. Due to their quality features, such as colorfastness, shrink resistance and clean finish, these are highly appreciated by the clients. The sound infrastructure of our organization is established to manufacture and export utmost quality collection of Cotton Fabric. These are crafted at the state-of-the-art infrastructure facility of our organization, which ensures flawless production. Our extensive product range includes Dobby Design, Seer-Sucker Fabric, Plain Weave, Dobby Design Polly Cotton Fabrics, Seer-Sucker Polly Cotton Fabrics, Plain Weave Polly Cotton Fabrics, Matt Fabrics, Linen Fabrics and Cotton/ Linen Fabrics. Also, our offered range is valued by our clients for their smooth finish, innovative designs, skin friendliness and appealing patterns. To meet our main objective of meeting changing requirements of our valued clients, we have established sophisticated infrastructure facility within our organization. Entire facility is maintained by our professionals, which lead us in flawless production procedure of our cotton fabric. Further, after completion of production procedure, each lot of fabric is quality tested by our experienced professionals, which assists us in delivering quality tested goods to the customers’ end. Moreover, facilities like, timely delivery, ethical business practices and easy modes of payment also assisted us in providing optimum satisfaction to our clients.